A man was hand-cuffed and brought to the police car. 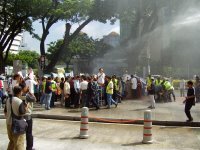 The FRU started shooting water cannon to the crowds. I was barred from taking photos by this FRU member. I almost fall down because of his pushing! "Look! You guys better get off my sight! Or I will bite you!" 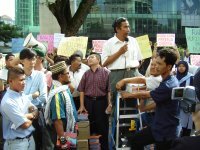 Dr Hatta was addressing the crowd. He was the first speaker. 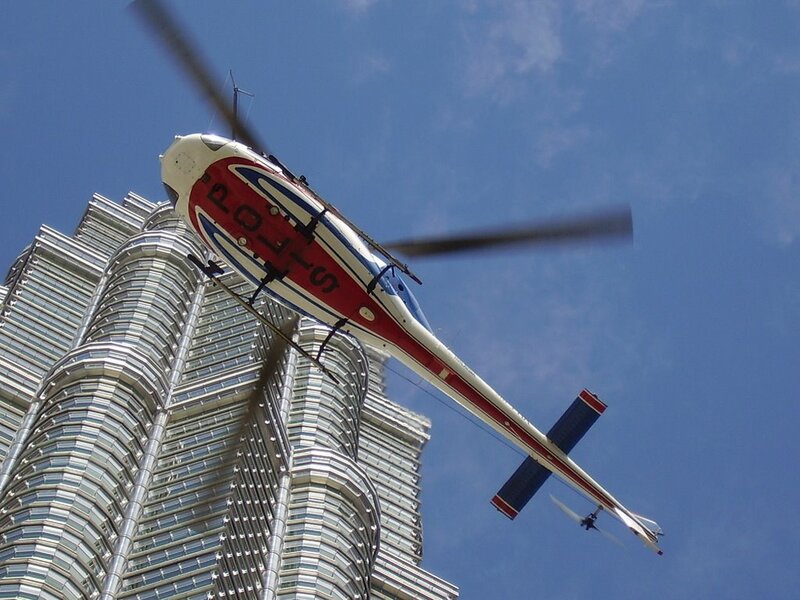 I have seen the copter a few times, but never it is so close to my eyesight until I can see the word "POLIS" beneath it. 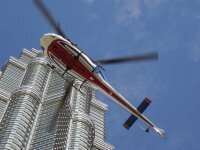 It was trying to fly low to interupt the demonstration with strong wind. A group of protestors came out with a banner. "Come on lah! Respect my right! Look at the Constitution! Read what it says!" For those who has been following my blog for the past one week, I am sorry for not being to update it as I am now in Kuching helping out our thr ee candidates in Kuching to fight their way to the Sarawak State Legislative Assembly Hall. 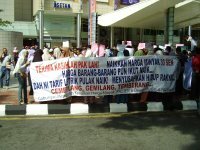 It is a tough and close fight in Kuching as SUPP is facing the toughest fight in almost every town and city in Sarawak. Sarawak urban Chinese seems to demand for a wind of change, of course, Chong Chieng Jen (35, lawyer, MP for Bandar Kuching) is a well known face in Kuching and he will fight SUPP’s Alfred Yap in Kota Sentosa. Yap is also a well-known figure in Kuching and it is alleged that he was ordered by CM to come to Kota Sentosa in order to prevent Chong to be elected as ADUN. According to Chong, it is important for him to be elected to the State Legislative Assembly Hall so that he can continue to expose all the wrong-doings and malpractices in the State Government. 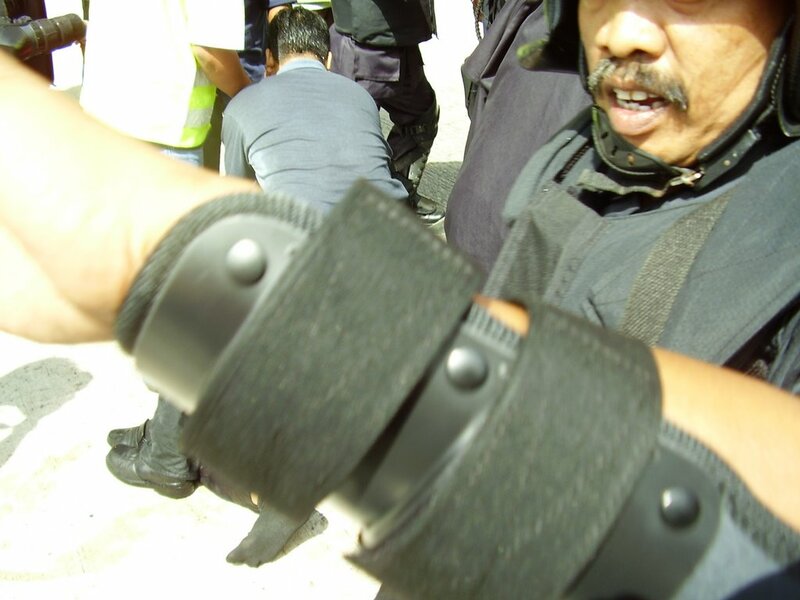 The warfare in Kuching is quite organized and the morale of the members here are very high. All are expecting either two or three seats from Kuching. The other two DAP candidates are Violet Yong Wui Wui (29, lawyer, DAP candidate for Pending) and Voon Lee Shan (51, lawyer, DAP candidate for Batu Lintang). Violet Yong will face incumbent Sim Kheng Hui, an old guard in Pending while Voon will be fighting incumbent Chan Seng Khai who is also the Mayor of Majlis Bandaraya Kuching Selatan. All there warfare are tough fight and we shall see if the Rocket can fly high in Kuching on 20th May. Public Rally in Singapore, More Than 10,000 - Believe it or not?? 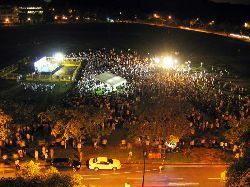 Frankly speaking, I have never imagined that this will happen or this can happen in Singapore - a public rally organised by opposition party, Worker's Party, which drew more than 10,000 voters in a pseudo-democratic society like Singapore. 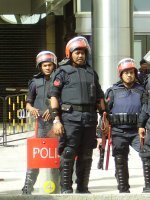 Malaysians can no longer tolerate reason that Public Rally is a threat to public safety, unless we admit that we are less capable than Singapore to preserve public safety and order, which I believe is not the case here in Malaysia. If Singapore's Opposition can be granted permit to organise such public rally, there's no reason why Oppositions in Malaysia not allowed so. 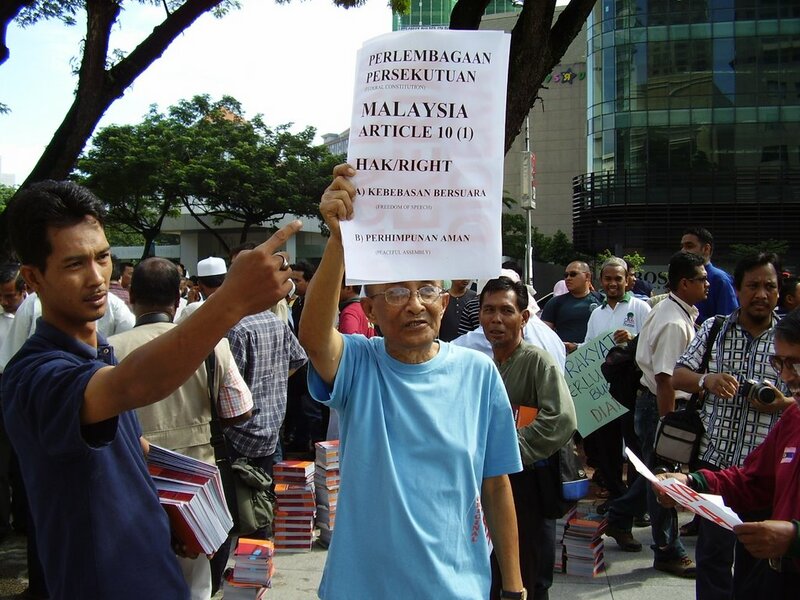 So, where is our permit, Pak Lah? 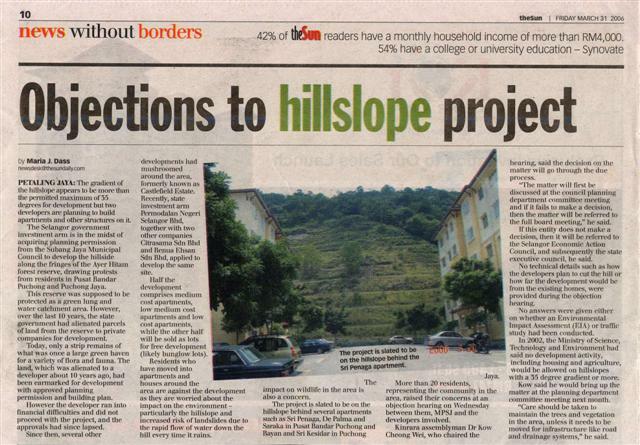 Development Project in Puchong Ayer Hitam Forest Reserve - Continue or Not?? 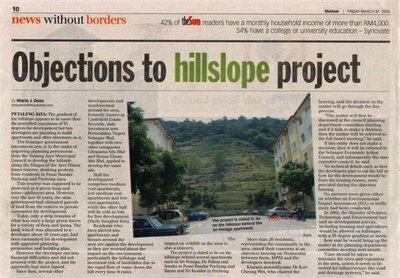 It is already more than a month and yet the local council (Subang Jaya Municipal Council) and the local state assemblyman who is also a MPSJ councilor failed to reply with any outcome on a hillslope project which is to be developed along the fringes of the Ayer Hitam forest reserve. Residents residing around the area from Sri Penaga Apartment, D’Palma Apartment, Saraka Apartment, Sri Cempaka Apartment, Desa Tanjung Apartment and D’Kiara Apartment have already submitted their disagreement to the Department of Planning and Development, Subang Jaya Municipal Council on 28th March 2006 in an objection hearing between them, MPSJ and the developer involved. The hearing was chaired by Kinrara Assemblyman Kow Cheong Wei. State investment arm, Permodalan Negeri Selangor Berhad, together with another two developers, Citrasama Sdn. Bhd. and Benua Ehsan Sdn. Bhd. applied to develop the same site. 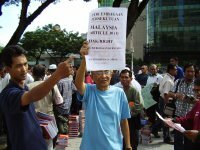 The three developers had applied for a planning permission (Kebenaran Merancang) to develop the area. 1. that Ayer Hitam Forest Reserve is the last piece of green lung available in Puchong and it shall be well-protected by the authority without being turned into any housing projects. Residents have been told by their developer, SP Setia Berhad Group, that this piece of land is another forest reserve which shall not be developed. 2. that the retention pond is also located too close to the hillslope and the pond must be combined with a bigger one for easier supervision in future. 3. that landslide, land erosion, air and water pollution, flash floods as well as other natural disasters can easily take place once the hillslope is developed. After all, over development is another major cause of flash floods and storms took place in Klang Valley recently. 4. that the development will definitely worsen the already congested traffic in Persiaran Wawasan, Persiaran Indera, Persiaran Bukit, Jalan Wawasan 4/12 and the junction going out to LDP. 5. that the Primary School Reserve for Pusat Bandar Puchong is located to close to the main entrance of the project. 6. that the gradient of the hillslope is more that 35 degree which is beyond the maximum allowable gradient for any development projects. ‘“The matter will first be discussed at the council planning department committee meeting and if it fails to make a decision, then the matter wil be referred to a full board meeting,” he said. It is a surprise that technical details on the construction and the content of the EIA and traffic report for the project were provided during the objection hearing. For such a project It is most disappointing that to date, the local council and the state assemblyman had yet to announce any decision or any outcome from various meeting as well as of whether the meeting had been held or not. Local council shall not practice secrecy in their running and any progress on this matter shall be made known to the public.